I was super excited when I saw this linky go live last week. As an 8th grade teacher, I, to the surprise of many, do not use many worksheets. By the time students reach 8th grade, you would think that they have kind of leveled out. This is a very big misconception. I have students who range from a 3rd grade reading level (ELLs) to a 12th grade reading level. I have to be mindful of my instruction and assessing/checking for comprehension due to this. Yes, worksheets do have their place (Standardized testing format), but they are much harder to differentiate, so I choose to work smarter and NOT harder. 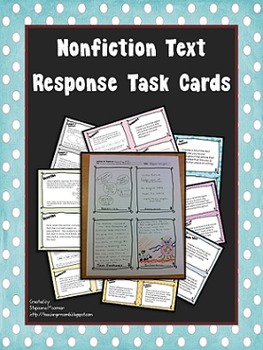 I am always scouring TPT for open ended task cards that will work for my kiddos and recently found some that are amazing. Click image for TPT page. They are from the fabulous Stephanie from Teaching in Room 6. I know they say they are for up to 6th grade, but these worked perfectly as a scoot activity with my 8th graders after we finished our quick novel study of Freak the Mighty. I gave them 5 minutes at each topic, so they had to stay on task and focused the whole time. They even commented how much they enjoyed it. Shaking things up causes student engagement to grow, which is always a plus when you have 54 minute periods. This was also perfect "test prep". The cards get progressively harder, but all require textual evidence. This is a must for my 8th graders because the majority of the questions on the STAAR (Texas Standardized Test) are higher level thinking. No more of those easy hunt and find answers. I am excited to be able to use this earlier in the year for the next school year. 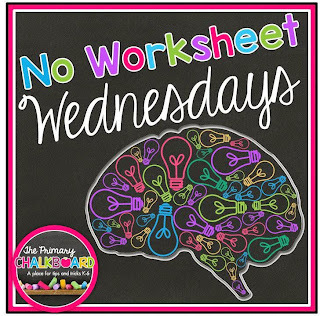 I can't wait to read about more non-worksheet options and continue to share mine on Wednesdays... Head over and check it out! I LOVE it! 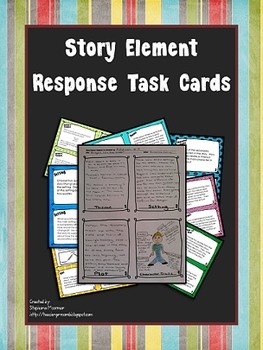 Thank you so much for blogging about how you used the cards in your room. I absolutely adore seeing the things I create in use in other classrooms. I also love that you cut the cards the same way I do (without bothering to take the white part out ;)) haa haa I am so glad they worked out so well in your room.